Salsa? Yes! Mexican Bean Beetles ? No! 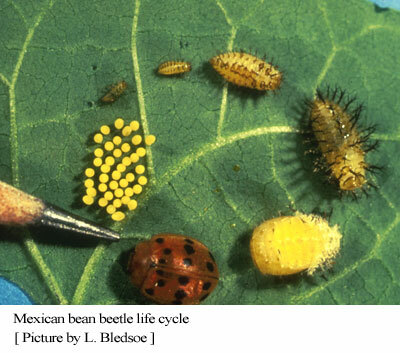 I’m a fan of multiculturalism, diversity, ethnic cuisine, but my enthusiasm pales when it comes to Mexican Bean Beetles. This morning I was reveling in picking my first crop of green beans when I came face to face with a Mexican Bean Beetle. Darn! Here is a great picture of their life cycle and, yes,as adults, they do look a lot like ladybugs which is probably how they escape our wrath. I’m providing some information about organic controls. Handpick adults and larvae whenever you see them. Squash egg clusters with your fingers. Once you see a few larvae, handpick daily to achieve good early season control. Interplant petunias with beans. Another popular companion planting approach involves growing rows of beans between rows of potatoes. Install floating row covers over bush beans in early summer, after the young seedlings have been weeded. Open the covers weekly to check for the presence of any adults or larvae, and remove them. Row covers work beautifully to prevent this bean pest, but lucky individuals occasionally emerge and prosper beneath them. If you have a home chicken flock, have the birds work over pulled bean plants before they are composted. Spray with a product based on the fungus Beauvaria bassiana (such as Mycotrol) as soon as Mexican bean beetle larvae are seen. When the first generation of larvae becomes infected with this fungus, sufficient spores are usually present to infect later generations. Release an imported, commercially-reared parasitic wasp called Pediobus foveolatus after Mexican bean beetle larvae have appeared. State support may be available to growers in New Jersey and Maryland. Keep a close watch on your growing beans in spring, and do not allow the first generation of Mexican bean beetles to triple itself by the time your beans grow into big, robust plants. Do all you can to provide food and habitat for beneficial wasps, flies, ladybeetles, and predatory stink bugs. Scout for eggs if adults are seen, using a small hand-held mirror to get a good look at leaf undersides. Planting plenty of flowers that attract beneficial insects is a sound strategy, along with maintaining seldom-disturbed islands that provide habitat for ground beetles and other beneficials. More information on organic Mexican bean beetle control is available from the University of Massachusetts, Cornell University and Florida State University.